Buffalo Bills defensive lineman Adolphus Washington was arrested Monday night on a weapons charge. Washington could now face disciplinary action from the NFL which might result in a suspension for the backup defender. The Bills selected the Ohio State defender in the third round of the 2016 draft. 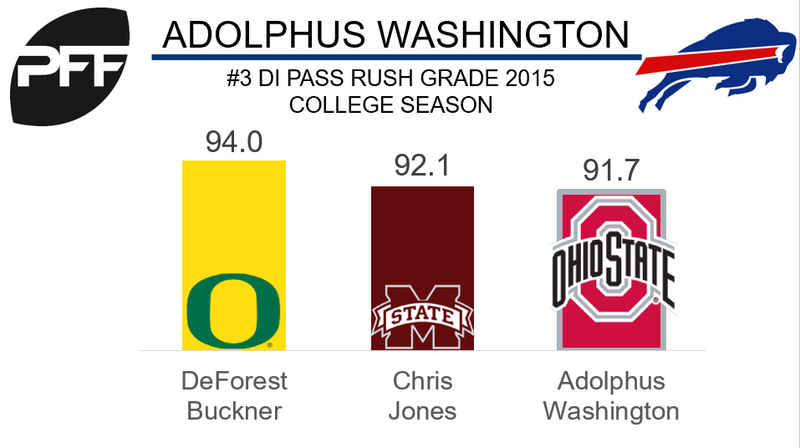 While at Ohio State, Washington showed great ability to rush the passer, earning a pass-rush grade of 91.7 in the 2015 college football season, third among interior defenders. Washington showed glimpses of his pass-rushing ability in limited snaps last season, collecting three sacks, which tied for second among rookie interior defenders. Although Washington had only three sacks his pass-rush productivity of 3.4 tied 13th among 18 rookie interior defenders, with only five total pressures on 134 pass-rush snaps (PRP measures pressure created on a per-snap basis with weighting toward sacks).